References to this William Reeves, son of James, as the William Reeves who died in Madison County KY continue to appear in poorly researched and dubious sources, but DNA has proven that to be incorrect as does a copious amount of documentation in both Guilford and Wake Counties of North Carolina. 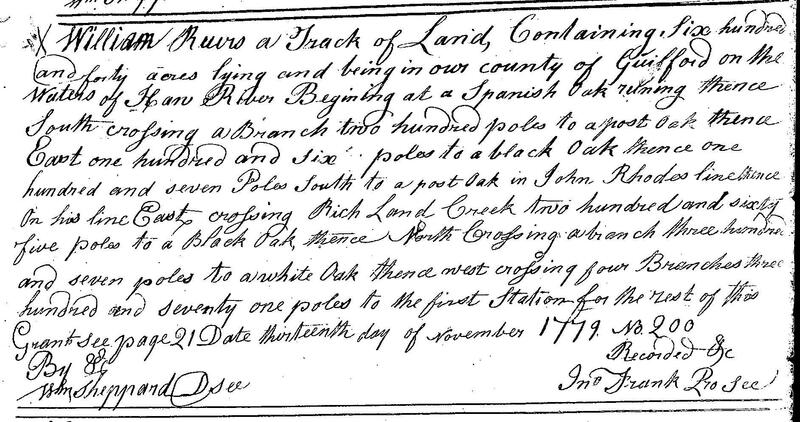 William Reeves is named in the records of Guilford County by 1779 when he received a grant of 640 acres on the Haw River adjoining property of John Rhodes. 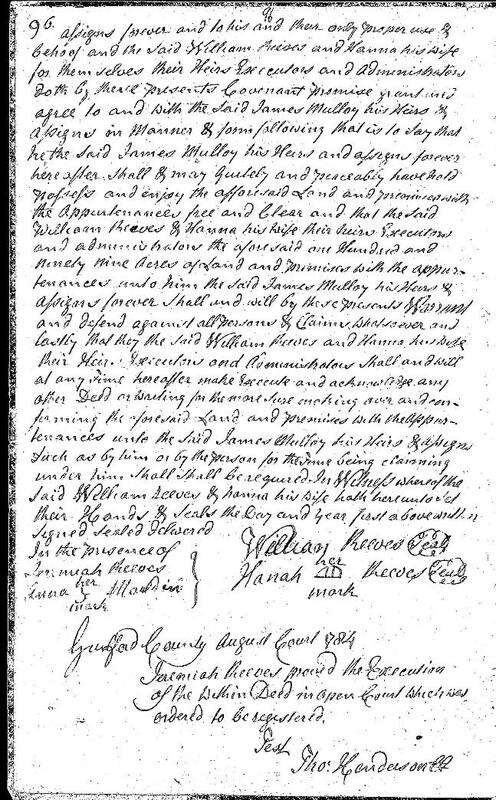 William was named an executor of his father James Reeves' will of 1781. 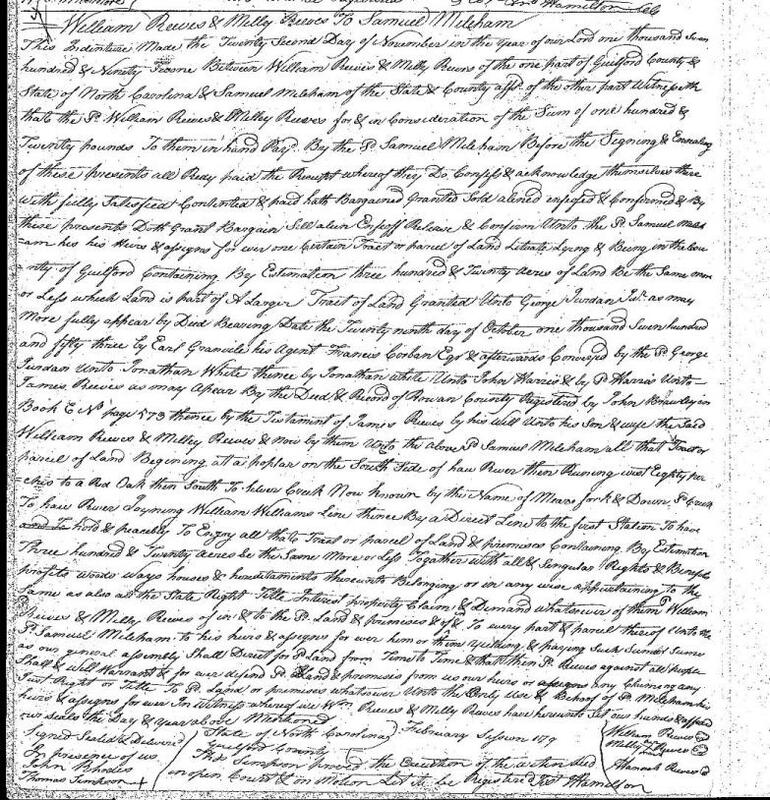 A deed dated 1 Apr 1784)) recorded in Guilford County, NC Deed Bk 3 Pg 95-96 (document as entered in deed book) names his wife as Hannah as does a 1791 deed by William and his mother Millicent. In that deed dated 22 Nov 1791, William and his mother Millicent were selling 320 acres to Samuel Mileham. The deed stipulates that this is the plantation conveyed by James Reeves' Will unto his Son & wife "the said William Reeves & Milley Reeves". Hannah Reeves, wife of William, relinguishes her dower rights. Did the compilers of the Reeves Review consult only an abtract of this deed and never view the entire document (as written in deed book) thus beginning the incorrect assumption that William Reeves had yet another wife named Milly? William Reeves was one of the providers of bail or security for Fortune Reeves and her son, Jesse, for the administration of the estate of Malachi Reeves in November of 1784. He also appears in the Guilford County Court Minutes serving on juries in Feb 1785, May 1785, May 1787, Aug 1787, Nov 1787, Feb 1790 and May 1790. In the 1790 US Federal Census of Guilford County NC, William Reeves' household consists of 1 Male over 16, 3 Males under 16, 5 Females and 1 Slave. This is William, the son of James Reeves, not a son of Malachi and Fortune Reeves since James' son William is still living in Guilford County in 1791 when the above transaction selling James' plantation to Samuel Mileham takes place. There are countless records in Guilford County beginning with the 1779 grant until William Reeves migrated to Georgia sometime before 1800 that document his continued residence there. Alternately, William Reeves who died in Madison County, Kentucky is recorded repeatedly in the records of Wake County, North Carolina during the same time period. William Reeves, the son of James, is recorded during this period living in the area of Mears Fork of the Haw River in Guilford County while William Reeves of Madison County, Kentucky is simultaneously recorded living ninety (90) miles away on the Neuse River in Wake county. It is preposterous to believe that these could be the same individual. William left Guilford County sometime prior to the 1800 US Federal Census. The above deed of 22 November 1791 in which William Reeves and his mother, Milly, are conveying to Samuel Mileham the plantation left to them by James Reeves in his will, would appear to be in preparation for their removal from Guilford County. Several members of this Reeves family can be found in Wilkes County, Georgia in the early part of the 19th century, including James Reeves' son Jeremiah and the William below with wife Hannah. A comparison of the signature above from John Rhodes' probate files and that of the William Reeves who died in Wilkes County, Georgia should establish whether they are the same individual. Page 55 - Reeves, William. To wife Hannah all estate for life, provided she gives to the following children a bed etc upon marriage, Hezekiah, Judith, Cynthy, Jeremiah and Sally Reeves. At the death of wife Hannah all residue to be divided among the above named children after paying Robert Cunningham who married Lucretia Reeves, Alex Seal who married Elizabeth Reeves, Robert Graham who married Hannah Reeves, all daughters of the testator, and John and Elijah sons of the testator, $5.00 each. Wife Hannah and Eustus H. Rhodes, Excrs. Signed May 18, 1816. Probated Nov. 5, 1816. Lewis McClendon, James Whatley, R W. Collier, Test. Reeves, William dec'd est. Receipts Cinthia C., Elijah, Hezekiah, Jeremiah and Judith Reeves, Robt. Graham, Thos. Roberts for himself and John Reeves, Jos. Wheatley who married Sally Reeves, all in full of their legacies, Feb. 12, 1827. Eustis H. Rhodes, excr. (See will Vol. 1 p. 98). The Reeves Review has listed this William Reeves as a son of Malachi and Fortune Reeves; however, there is an abundance of documentation that substantiates that William Reeves who died in Wilkes County, Georgia, was actually the son of James who had previously been misidentified in that book as William Reeves of Madison County, KY. To add to the misinformation published in that book, William Reeves the supposed son of Malachi and Fortune Reeves married one Hannah Smith. A search for any such marriage yields the marriage of a William Rives to Hanah Smith in Mecklenberg County NC in December, 1820 - 4 years after the death of this William Reeves in Wilkes County, Georgia. Based upon research of the probate, deeds and other records of Guilford County, there is no record that Malachi and Fortune Reeves ever had a son William. Among all the deeds by Fortune Reeves conveying property to their sons after Malachi's death, there are NO deeds to a son, William. The only reference to a William Reeves was in the will of John Rhodes which is surely William, the son of James Reeves.